“L” type prewound bobbin can be used for approximately 60% machines. Although some machine manufactures warn not to use prewound bobbins, it is a fact that most of the embroideriers do use them. It is very important to make sure you use a good quality thread and clean the bobbin area steadily. Prewound bobbins hold up to three times more thread than self-wound bobbins, so the advantage is in saving time and not having to wind your own bobbins. 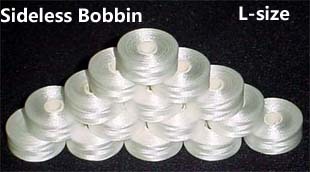 All machines come with bobbin winders, so you have the option of a prewound bobbin thread or winding your own. 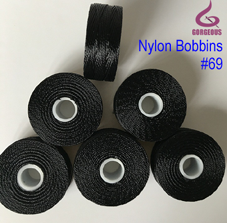 Usually we recommend nylon prewound bobbin#46 & #69. 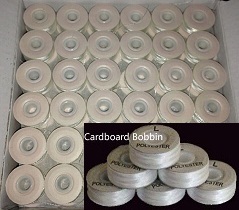 Our nylon prewound bobbin #46 & #69 could meet almost all specifications for automotive, furniture, and industrial use. If you need other styles of bobbin thread, please feel free to contact us. Copyright© 2009-2019 Jiangxi Xuanli Thread Co., Ltd. All Rights Reserved.